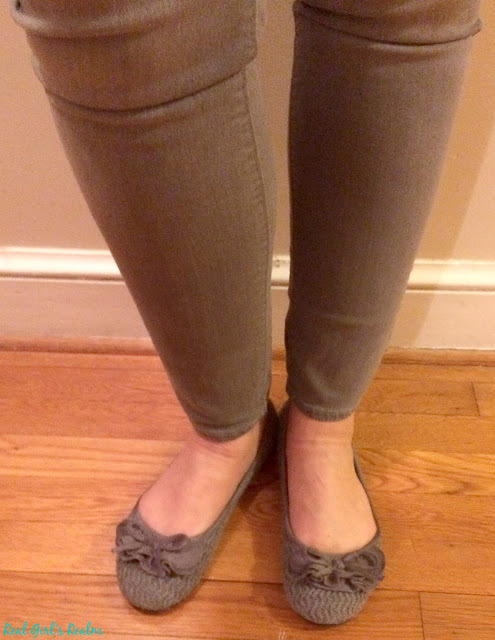 I have been on the lookout for affordable grey skinny jeans all season. I lucked out and found these Mid Rise Rockstar Skinnies at Old Navy on clearance for $11! I had to go up a size for them to fit well on my legs, but otherwise, I love them! I usually require Tall length (these are Regular), but they still fall at my ankle, which allows me to wear them with boots or flats. They are a mid-rise, so they sit right below my belly button, which is how I like it. 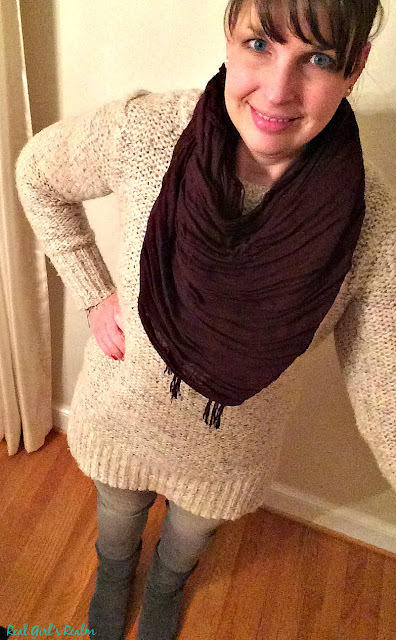 I styled these jeans with a blush, over-sized sweater, plum scarf, and grey Ugg style boots. 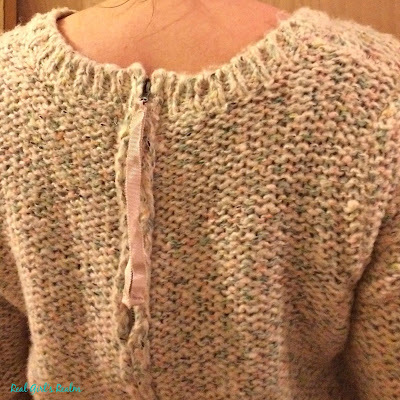 I love the zipper detail with the ribbon pull on the back of the sweater! Head over HERE to see more ways to style a scarf. 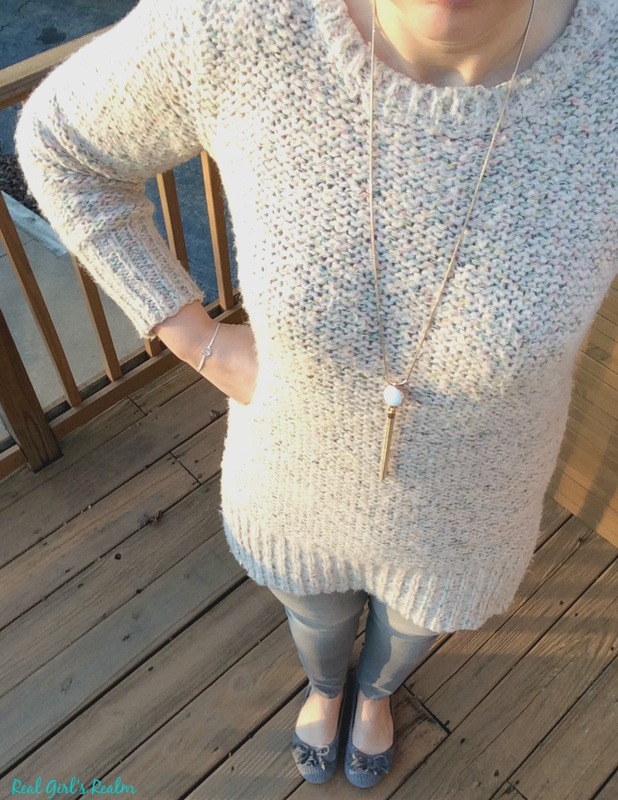 I changed up the look by removing the scarf and adding a mint and gold tassel necklace and grey flats made of sweater material with a ruffle and bow detail on the toe. Here is a close up view of the fit. They are a stretchy jean, so the material hugs my curves, which is why I went up one size. I am 5'9 and you can see the regular length hits right at my ankle, which is perfect for wearing with flats. What brand and style of jeans do you feel most confident in? 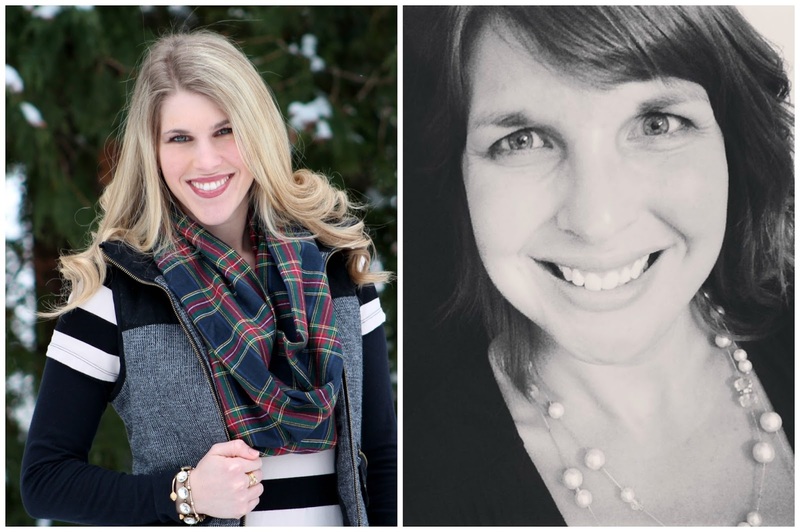 I am excited to be Co-Hosting the Confident Twosday Link up with Laura from I Do deClaire. I have only been following Laura for a little while, but I love her style and how she promotes confidence among women. I hope you will join me this week and link up your fashion posts! Use the button below to add your link. Thank you so much for co-hosting! You are looking fab in those jeans! I love the Rockstar fit at Old Navy, but they do run a size small! That sweater is so pretty with them! Thank you Laura! I was happy to have found these jeans, especially on sale! Thank you Andrea! I was so happy to find these jeans and the sweater is one of my favorites! I've had my eye on a pair of gray jeans, I need to try Old Navy it sounds like. I love how you styled them here! Thank you! I usually have not had good luck with Old Navy jeans in the past, but I like how these fit! Thank you so much for your kind words! I have only recently branched out into skinny jeans, but I have to have the right fit. Ah that sweater looks so comfy -- since it's blizzarding right now here in Chicago I really think I need a cozy sweater like that! The sweater is so soft and warm! It was such a great find at TJMaxx for under $20. Thanks for reading! Very pretty color combination! I just wore my grey Rockstar jeans this past Friday - they are so comfortable. :) The ribbon detail on your sweater is super cute. Thanks for linking up, Mary! Thank you so much! I love the jeans and the back detail is pretty much the reason I bought the sweater! I love gray jeans! Super cute! Thank you! These are my first pair and I love them too!